On the job injuries are some of the most common reasons for patients to visit the chiropractor. It is not uncommon to see everyone from office workers to contractors and even teachers visiting the chiropractors office in search of effective pain relief options. Whether you're simply experiencing severe neck pain or you're actually dealing with the symptoms of a herniated disc, spinal decompression therapy is an effective nonsurgical treatment option that can relieve your pain and help get you back to work. 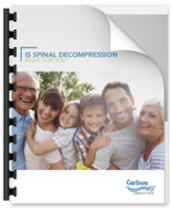 DOWNLOAD OUR CONSUMER GUIDE TO SPINAL DECOMPRESSION NOW. If you have been living with chronic back pain for quite some time or other related spinal conditions, you understand how disruptive these symptoms can be to your day-to-day life. Here's what you need to know to find out if spinal decompression therapy is a viable treatment option for you. The nonsurgical spinal decompression treatment option involves a type of motorized decompression that is meant to relieve chronic back pain and get patients back to work and living a normal life. This type of therapy works by gently stretching the spine to change the force and position of your spine and take pressure off of any injured discs. These discs act as a cushion between the bones in your spine and when they become injured (bulging or herniated), they can leave patients living with a great deal of pain and discomfort. As a result of nonsurgical spinal decompression therapy, bulging or herniated discs may retract and take the pressure off of your nerves and other structures in the spine, providing much needed relief. Additionally, by creating negative pressure on injured discs, spinal decompression therapy can help promote the movement of oxygen, water and other nutrient-rich fluids into the spinal discs so that they have a better chance of healing properly. Visit the experienced team at Carlson Chiropractic Center online for more information spinal decompression therapy and other nonsurgical treatment options and schedule your initial consultation today! NEED MORE INFORMATION ABOUT SPINAL DECOMPRESSION? CLICK BELOW TO DOWNLOAD THIS FREE GUIDE.